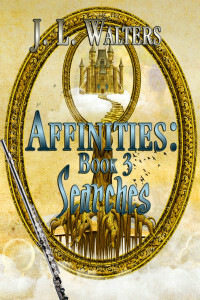 Having found a safe place in a tower fortress, the four and their companions set out to find what they need to defeat Dom Senet and He Who Walks With Evil. They divide into three groups. The first group seeks the focus stones that enhance their affinities. The second group looks for the remaining artifacts, the swords, the staffs, the flutes and the scrying bowls. The third group sets out to find those with their affinities to round the groups to four of earth, four water, four air and four fire. Their strength will be needed in the final battle.